The M&A global market remained vibrant in 2017 with transactional volume coming in just under the 2016 level — 2017 was the fifth most active year in terms of global deal volume. Global interest rates remain at historical lows, notwithstanding the slight increase in U.S. rates. Roughly 15,000 deals transpired in the U.S., the most in a year since the beginning of the new millennium, with cross-border deals accounting for 30 percent of total deal volume (down slightly from 36 percent in 2016). In its May 2018 global outlook, the Organisation for Economic Cooperation and Development (OECD) forecasted G20 growth rates of 4 percent and 4.1 percent, respectively, for 2018 and 2019 and forecasted non-G20 country growth slightly under 4 percent — encouraging forecasts all around. The unprecedented M&A cycle in which we find ourselves shows no signs of slowing halfway through 2018, either. According to Thomson Reuters, the number of deals exceeding $5 billion in value in 2018 will double from 2017. Relative to 2017, overall M&A deal volume may have declined so far this year, but deal values have risen. United States Tax Reform: The largest U.S. tax overhaul in more than 30 years provides a reduced top U.S. corporate income tax rate, dropping from 35 percent to 21 percent. In addition, the new law taxes, albeit at a reduced rate, overseas earnings that were formerly taxed only upon repatriation, potentially making it less costly to repatriate offshore cash. Moody’s estimated that at the end of 2017, U.S. companies were holding roughly $1.4 trillion in offshore cash; if repatriated, these large cash reserves will likely boost corporate involvement in M&A and potentially whip up the already frothy valuations the market exhibits. Private Equity Dry Powder: High levels of dry powder available to financial buyers will also continue to contribute to the deluge of M&A activity. Data from Preqin suggest that private equity (PE) funds held roughly $1.1 trillion in cash at the 2018 mid-year mark. With such a cash hoard, funds should be well-positioned for the foreseeable future in M&A, whether competing with corporate buyers or making opportunistic investments in the event that a trade war or other market turbulence materializes. Brexit and European Elections: Notwithstanding continued media noise around the U.K. vote to exit the European Union (EU) and the need for the various governments to agree on the details of their prospective trade relationships, the powers that be appear to have constructed at least an outline of the path forward and largely alleviated the main concerns. The dissipation of such fears and the anticipation of a strong U.K. economy, should boost the European markets in the near-to-mid-term. Further, recent election wins in key European countries by political parties espousing conventional views should encourage and provide confidence to the markets as the European economic recovery continues. Base Erosion Profit Shifting Initiative (BEPS): The OECD has provided additional clarity into its BEPS project and its prospective administration. This has allowed multinationals to focus on compliance and to make relevant changes to their systems and processes. As companies’ grasp on BEPS compliance firms, uneasiness in the market regarding international tax reform should continue to subside and provide more certainty with respect to sound tax planning. Shareholder Activism: Over the last several years, shareholder activists have forced spin-offs or other disentanglements of non-core assets, permitting companies to focus on their strengths and to create more nimble and flexible models to gain competitive advantages. Fortuitously, U.S. tax reform has made taxable dispositions of assets– as opposed to tax free spin-offs — less burdensome and therefore more attractive in many cases for U.S. multinationals than they have been historically. Shareholder activism should continue to drive M&A opportunities. In the final analysis, the strong global economy and the factors mentioned above should continue to fuel global M&A activity in the short term. Cross-border M&A should continue to expand at a faster pace than purely domestic M&A as developing countries participate to a greater extent than ever in global markets. All indicators point toward a strong 2018 in M&A activity, with the transactional bears being held at bay for at least another year. 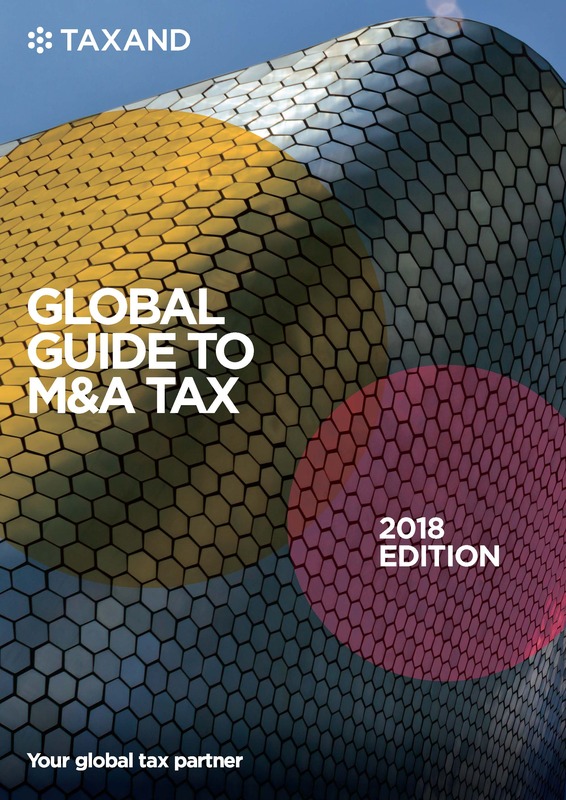 This edition of the Taxand Global Guide to M&A Tax has been designed as a desktop reference book covering 33 countries and to provide at-a-glance insight into the tax treatment of global mergers and acquisitions. It is intended to provide a basic introduction to M&A tax planning in each of the diverse fiscal environments in its scope and to facilitate understanding and conversation between global M&A tax team members; it should be viewed as a tool to help multinational advisors find common ground and mutual understanding, rather than as an encyclopedia. Global Taxand teams in each of the covered jurisdictions made essential and invaluable contributions to this book, and we thank them for their participation and support in this project. We are delighted to offer this guide as an example of the benefits that cross-border collaboration can produce.